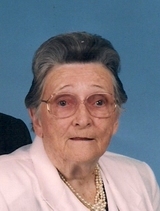 Obituary for Nellie (Hipps) Brookshear | Loudon Funeral Home and Cremations, Inc.
Nellie Hipps Brookshear 95, of New Macedonia Community, Philadelphia passed away Sat April 3rd, 2010 in Crown Point Ind. Nellie was a member of New Macedonia Baptist Church and preceded in death by husband, Joe Brookshear; Parents, Charlie and Alice Hazlewood Hipps. Survivors : son, Larry Joe and Cindy Brookshear of Indiana; One granddaughter; Brother,Tommy Hipps of Washington State. Funeral Services 7 p.m. Tuesday Loudon Funeral Home Chapel with Rev. Rod Miller and Rev. Bill White Officiating. Interment 11 a.m. Wednesday morning at New Macedonia Church Cemetery. Visitation; 5-7 p.m. Tuesday Loudon Funeral Home.